As I write this we are rapidly approaching the end of quarter one. I cannot believe how quickly the year is zooming by. 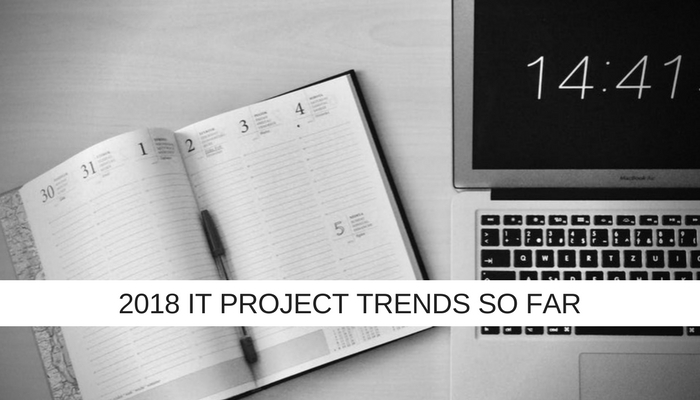 With the first quarter under our belts, I’ve noticed three distinct IT Project Management trends that I think are exciting (and to be encouraged) as we approach the rest of 2018. By the way, it doesn’t matter if you are reading this in June or September or even a year in the distant future, nor does it matter where you’re at maturity wise, these ideas are worth adopting at any point – it just so happens that I’ve seen something of a spike in the first three months of 2018 and I wanted to note it so we can all continue to make them happen. If you were to check back over the years, the percentage of projects delivered on time or delivering the expected benefits has always been rather low. Can you recall either measure returning a success rate over 50%? Me neither! The problem, in my view, has been one of prioritisation. Too many projects, too few resources. It presented some tough choices for teams. Do you continue to try to manage many projects, knowing that you’ll deliver a third of them well (and two thirds not so well), or do you manage fewer projects and super focus on delivering them to the best of your ability? Both options had their flaws, you couldn’t always guarantee which projects would fall into the third you delivered well, I’ve seen key, strategically aligned projects fail because attention got switched to less important projects with arbitrary, “more urgent” deadlines. Also, if you start to turn down projects it’s not long before the board start to question the value of having a PMO! The Project Management As A Service (PMaaS) market has delivered a brilliant compromise that I am seeing more organisations adopt in the first quarter of 2018. Better prioritisation is allowing CIOs and Project Leaders to focus in-house talent where it is needed most. When you do this, capability gaps become apparent and these can be plugged with resources from the PMaaS market, whether that is individuals or teams or full end to end project management. Instead of turning down projects, teams operating like this are expanding their capability, those that I am working within this way are on course to deliver successful projects. The measures of success that we’ve used for years are no longer enough on their own. Scope, time and budget all still have their place but as competition ramps up, the Project Management profession needed to drill deeper. The value of what a project delivers against what it set out to is increasingly important. I am happy to see clients and industry friends alike finding ways to measure expected versus delivered benefits. I think that this may have been prompted by the PMI choosing to focus on levels of what they called “benefits realization maturity” (as well as the tried and trusted measures) in their Pulse of the Profession report for 2017. They were able to identify the gulf between “champions” and “underperformers”, the former having higher project success rates (92% versus 33%). It may be the PMI’s adoption of “benefits realization management” as a measure, of course, it may just be a coincidence. However, I am seeing this success yardstick increasingly used by IT Project teams and it is no coincidence that teams with this focus are enjoying more successful business aligned returns. The “collective process of identifying benefits at the outset of a project and ensuring, through purposeful actions during implementation” was a trend that started in 2017, when almost a third of organisations (31%) reported high benefits realisation maturity. I am encouraged to see anecdotal evidence that 2018 has, so far, seen a further rise in its adoption. IT Projects feel like they have greater “c-suite” representation than ever before, three IT Project Leaders I’ve known for years have taken newly formed roles within their businesses as CIOs this year already, giving me an exciting sense of the direction of travel for the profession. Spring 2018 heralds the opening of applications for the Register of Chartered Project Professionals. The Association for Project Management (APM) has officially become ‘The Chartered Body for the Project Profession’. Royal Charter status gives the profession a certain gravitas and I get a sense that more businesses are now taking IT project management a lot more seriously! One business I know, that have ‘tinkered’ with project management resourcing projects on a pay as you go basis through PMaaS, just established its own Project Management Office (PMO). Furthermore, a number of organisations who previously weren’t benefitting from even basic Enterprise Project Portfolio Management have taken a step towards greater maturity, better governance, more defined gating of project stages, tracking of benefits, methodologies, etc. All in all the signs for the rest of 2018 are very encouraging! I hope that you are a quarter of the way to achieving your 2018 IT Project goals; if I can be of any help in the remaining three quarters, or you’ve spotted any IT Project trends emerging, I’d love to hear from you.